Today's Image of Mars shows a small floral-shaped volcano in Cerberus Fossae.You can see the flows because they are darker than the surrounding terrain and radiate away from the opening, forming a flower shape. The volcano lies at the flank of a larger one of the Cerberus Tholi. Cerberus Fossae is a series of roughly parallel fissures created by faults which pulled the Martian crust apart in the Cerberus region, which is located at around 9°N, 197°W. These faults are the result of the formation of the Elysium Volcanic Field. They pass through preexisting features, like hills, which indicates that the faults are relatively recent. 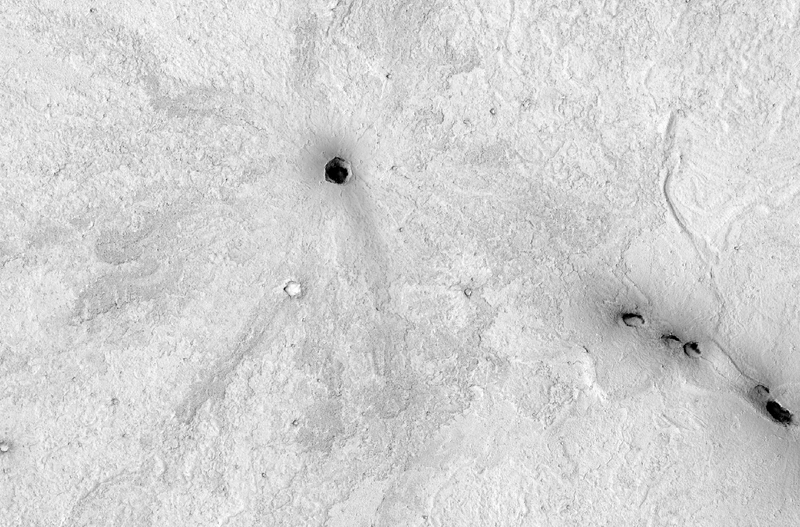 Clicking on this image will take you to a captioned sub-image of this from HiRISE.